Max Blumenthal, "Goliath: Life and Loathing in Greater Israel"
Goliath is a portrayal of politics and society in Israel, the West Bank and Gaza by a Jewish American journalist deeply troubled by what he encountered over a two-year visit. Max Blumenthal's account ranges from meetings in the Knesset and coffee with tech entrepreneurs in the mixed Jewish-Arab towns of Jaffa and Haifa, to confrontations between Israeli soldiers and popular committees in Palestinian villages. The book is written as an expose and so discrimination against the Arab population and African immigrants is a significant part of the story, alongside the rise of the far-Right in Israeli politics. Although this is a well-researched depiction of disturbing trends in Israeli society, Blumenthal tends to highlight Israel's more extreme elements at the expense of moderates, who prioritize Israel's security and Jewish character but still want peace on just terms. The Israelis presented are either tear-gassed activists or hatefilled racists. A less polarizing portrayal would have found a wider audience among readers interested in Israel, who could have gained new insight into the conflict from the book's important coverage of army abuses in the West Bank and Gaza. 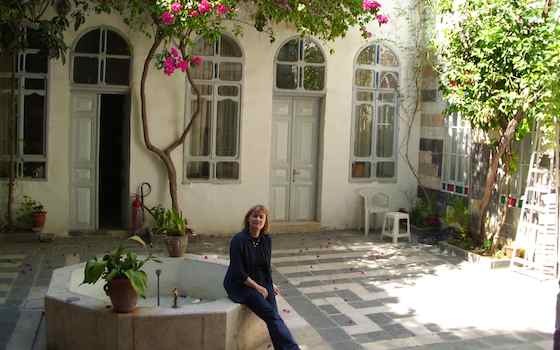 Diana Darke, "My House in Damascus: An Inside View of the Syrian Revolution"
In 2005, while on a research trip to write a Syria guidebook, Diana Darke took an impromptu decision to buy and restore Bait Baroudi (House of the Baroudis), one of Old Damascus's many poorly maintained courtyard houses. Beginning with her 2005 visit to the country -- not her first, as the author had spent her career in the Middle East as a diplomatic wife and interpreter -- she explores its cultural, historical and religious heritage, while introducing the reader to the Syrians she comes to know and befriend through her restoration project. Throughout the narrative, Darke traces the fate each place, person and monument has met since the 'events' that began in 2011. Her sympathetic character portraits, and description of the losses suffered by each of her friends, give the conflict a human face which remains hidden in much media coverage. Part memoir, part travelogue and part reflection on Syria's descent into civil war, this eclectic book is both an elegy to a lost world and an attempt to understand how Syrian society has reached its current nadir, while also looking for the elements of resilience and hope that could promise a better future. Zaid al-Ali, "The Struggle for Iraq's Future: How Corruption, Incompetence and Sectarianism Have Undermined Democracy"
Al-Ali, an Iraqi who spent most of his life outside Iraq and who returned in 2005 to assist the UN with the constitutional process, places a particular emphasis on the rise of sectarianism, the lack of legitimacy of Iraq's current rulers and what he calls an undemocratic, rushed and ineffective constitution. The book is set in the post-conflict reconstruction phase between 2003 and 2008. An analysis of Iraq present and future cannot omit the country's recent history and in looking at the problems al-Ali misses aspects of recent events that underpin some of the most pressing challenges, including its sectarian divisions. Al-Ali's efforts to propose a roadmap for Iraq, one based around stronger civil society actors, misses the more nuanced dynamics of Iraqi politics and the political and social realities of the country. Nevertheless, this is a welcome addition to the debate about how Iraq might move forward. Al-Ali should be commended for extensive travel to Iraq in preparation for this book, an accolade few authors of Iraqi history and politics deserve.